By undergoing more than of high temperature temper treatment, this screen protector's compression strength reach as high as 125MPa, 5 times higher than regular glass. 99% transparency preserves the original screen brightness. You can enjoy a great viewing experience with more brightness and less glare. The hydrophobic oleophobic coating largely reduces smudges and fingerprint. 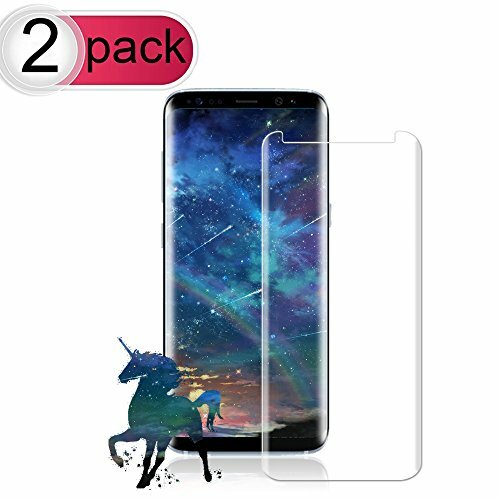 Premium Flexible: Includes screen protectors for Galaxy S8 Plus, effectively prevent the dust, scratch, fingerprint, glare and reflection on the screen. High Definition and Touch Sensitive: Highly responsive and sensitive touching performance with 99% clarity keep your device fast responding while providing a natural viewing. Edge to Edge Protection: Precise cut and full coverage specially designed for curved edges, fit your phone's screen perfectly and provide maximum protection for your Galaxy S8 Plus. Oleophobic Anti-Fingerprint Coating: Offers tough, durable, transparent surface while keeping your screen free of fingerprints, oily smudges and is easy to clean. Please read our installation instruction carefully before you start apply. It is the key to your success. If you have any question or concern, please feel free contact with seller support. If you have any questions about this product by Live2Pedal, contact us by completing and submitting the form below. If you are looking for a specif part number, please include it with your message.